The utterly decadent decor at the Vanda Villa, The Sanchaya in the Indonesian Island of Bintan came alive with roses — in more than 50 shades of pink — to celebrate the recent launch of Bulgari’s new scent, Rose Goldea. Just one whiff and you know it’s not your regular sweet-smelling floral fare. Neither is it an aggressive rebellion against all things feminine and elegant. Rose, which is at the heart of the perfume, is given a modern interpretation, wrapped in the forested warmth of sandalwood and the animalistic allure of musk. The journey behind this fragrance, the olfactory power of which announces the arrival of its wearer well before the other senses do, began with the idea to push reinvention. “How does a brand such as Bulgari, which is more than a century old, stay alive and young? If we were to give the younger generation what their grandmothers possessed, they will get so bored that they will bid us goodbye,” points out Valerie Manini, perfume business unit managing director. “While we do have Omnia and Le Gemme that are inspired by our signature gemstones, the Goldea family pays tribute to the metal. It is the noblest material that magnifies the brilliance of gemstones.” Just as gold brings out the brilliance of gemstones, master perfumer Alberto Morillas used musk to heighten the aroma of the other ingredients. While the first Goldea was an ode to yellow gold, this one celebrates the feminine elegance of rose gold. The new scent is meant to revisit the classic and give it a modern spin, and what better note than rose, a veritable pillar of perfumery. As its muse, Cleopatra, a feminine archetype intrinsically linked to the power of rose, was a unanimous choice. One of the most famous beauties in history, Cleopatra had mastered the art of seduction, enticing the two most prominent leaders of the time — Mark Antony and Julius Caesar. “She was like the Lady Gaga of her time. She knew how to impose her personality and to create a wow effect. Before the Romans saw her, they smelled her. She announced her arrival to Rome, a place alien to her, by perfuming her boat with roses, and having all its streets adorned by its petals. She covered her body with snakes, symbolic of danger, but also of attraction. And I’m talking of this element particularly because when we create a fragrance and its bottle, we have to give a brief to the designer.” In sync with the spirit of Cleopatra, the bottle has a solar disc on its head and a delicate snake in rose gold around its neck. Manini explains how Morillas drew inspiration from the story of the muse. He researched extensivelyto recreate the scent of this legendary temptress, celebrating her power, fragility and femininity. 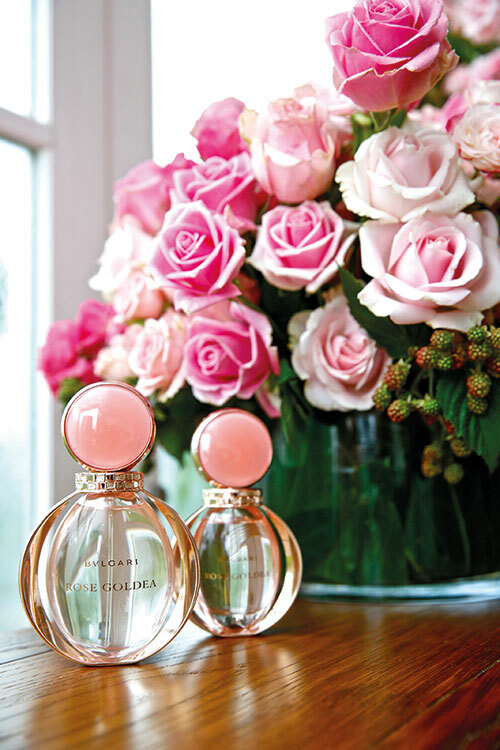 “Creating Rose Goldea has been an extraordinary adventure because we wanted to interpret the emotional dimensions of one single flower, the damask rose, the most prestigious one…. It embodies royalty and reflects a woman who is almost unattainable,” elaborates Morillas. In a veil of sensual white musk, this floral and fresh scent wraps precious damask rose absolute with jasmine from Egypt. The presence of pomegranate adds a touch of sweetness, and the effect is balanced by the smokiness of frankincense, beautifully rounded off thanks to a woody sandalwood trail. To wear Rose Goldea is to evoke the ancient beauty rituals of Egyptian women, their luxurious lifestyle, aromatic garments and exotic jewellery. A gentle reminder for women of today to stop and smell the roses. 6,000 to 7,000 tonnes of roses produced by Bulgaria each fall. The flowers are picked strictly in the morning — before they lose their freshness due to the sun’s heat — by hundreds of pickers each day. 1 million roses in each kilo of the flowers. For a kilo of rose oil, one needs about three-and-a-half tonnes. 1.5 tonnes of rose oil that Bulgaria makes in one year. 15,000 in dollars, the cost of a kilo of rose oil.